In addition to average weather conditions, climatological data also describes annual variations and fluctuations of temperature, precipitation, ____, and other variables. They represent the standard values for a location. They are averaged on a monthly or annual basis. They describe normal weather conditions. The information applies only to the place where the data were collected. A widely used climate classification system is the ____ system. Studies indicate that periods of low sunspot activity, like the ____, correspond to unusually cold climate conditions. The burning of fossil fuels releases large amounts of ____ into the atmosphere, which contributes to global warming. Types of climate data include annual variations in temperature, precipitation, and ____. Two climates that are at the same latitude may be different because of ____. When moist winds approach a mountain, they often drop rain as they rise over the mountain, and come down the other side of the mountain much ____. The climatic zone that receives the least solar radiation and has the coldest climate is the ____. 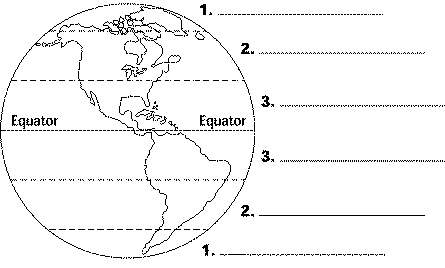 Using the diagram below, match each climate zone with its correct location on Earth. Why is it useful to collect annual variations in climatological data in addition to average weather conditions? Describe how the El Niño current causes changes in weather patterns along the northwestern coast of South America. Explain the effect that Earths wobble will have on future winters and summers in the northern hemisphere. In the diagram below, Earths elliptical orbit around the sun is shown. Does the position of Earth during winter represent what occurs currently with the axis tilted toward Polaris? Or does it represent what is theorized to occur by the year 14 000 when the axis will tilt toward Vega? Explain. Why would planting trees help reduce global warming? List two major reasons for climate variation. Why cant you use normals to predict the daily weather? How would seasonal climatic changes be different if Earth were not tilted on its axis? How might taking a bus instead of driving a car help ease global warming?